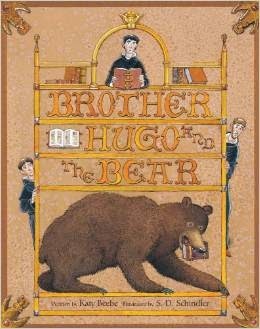 Brother Hugo and the Bear by Katy Beebe, illustrated by S.D. Schindler. Based on a real note found in a 12th century manuscript, a monk loses a library book when it is eaten by a bear, and makes penance by recreating the manuscript page by painstaking page. But will the bear be waiting for another course? An exciting read-aloud that teaches the process of how books used to be made, you don't have to be a bruin to find this book delicious. I only wish the publisher had invested in a little illumination...ah, well, nothing a gold marker can't fix.